"Do not weep for me, for my hour is near..."
Pleasant H. Smith as born on July 12, 1818 and died on February 15, 1892 at the age of 73. He was married to Irene Wood Smith. Both of them grew up at Clear Fork Baptist Church. Their families were very involved and extremely devoted church members from the very beginning of the church's existence. For instance, Pleasant's father, Jesse, and Jesse's brother, Phillip, installed the first floor in the original church meeting house. Phillip was a deacon. Pleasant's grandfather, George Smith, was a charter member. Irene's grandfather, Thomas Wood, was a church deacon, as was his brother, Samuel. Their brother, William, was a charter member of the church and served as clerk from 1802 to 1850. So, it isn't any wonder that on December 28, 1873, Pleasant Smith was ordained a deacon of his beloved church. He served his church faithfully. When he died in 1892, his family had been members of Clear Fork for nearly a century. Pleasant was so thought of that at his death, a committee was formed to write his obituary for a memorial page that would be added to the church minutes. The committee was comprised of deacon J.E. Reeves, trustee Hile Upchurch, clerk John Wilson and James Pittman. The obituary was published in the April 23, 1892 minutes. "The silent messenger of death has come in our midst and removed one of our trusted sentinels from His high place in Zion." "Tribute of respect by the members of Clear Fork Church of Christ to the memory of brother P.H. Smith. Dearly beloved brethren and sisters, we have no words by which we can express the gratitude due from us to our heavenly Father for sparing the lives of the dear brethren and sisters who are letting their light shine that others might be constrained to glorify our Father in heaven. Yet, the silent messenger of death has come in our midst and removed one of our trusted sentinels from His high place in Zion. And, we feel that his long life of usefulness secured for him the confidence of our entire brotherhood and entitles him to a memorial page upon the Clear Fork Church book. He joined the Clear Fork Church the fourth Saturday of October 1871. He lived a religious life in which he enjoyed uninterrupted fellowship and served as deacon 'til his death. His faithfulness entitles him to more than a passing notice. Bro. P.H. Smith was ordained deacon the fourth Sabbath in December 1873 by elders J.B. McCallon, John Garrett and Joseph Denton. Bro. P.H. 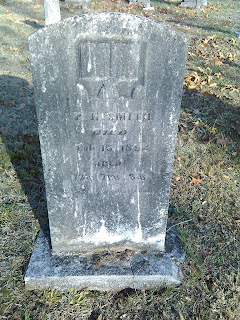 Smith departed this life February 15, 1892, aged 73 years, 4 months, and 3 days, but the labors of love with him have ended and his works following him. We believe our loss is his gain, hence we ought to submit to the will of our Heavenly Father who called His child (our brother) from labor to the rest of the good, and bind us more strongly in the bands of unbroken brotherhood. Nearly at deaths door, he tells his friends "do not weep for me, for my hour is near." Then, he entered into that sweet sleep from which none ever wake to weep. While we pay this last tribute of respect to the memory of him, we would shed tears of sympathy and Christian condolence with his grief smitten widow who was languishing on the bed of affliction at the time of her companion's death, and to his bereaved children." Done and signed by order of the church. Pleasant and Irene Smith are buried at Irwin Cemetery. Note: Regarding the phrase used in the obituary, "Clear Fork Church of Christ." The church has always been Baptist. For years, Clear Fork Baptist Church used the phrase, "The church of Jesus Christ on Clear Fork Creek."